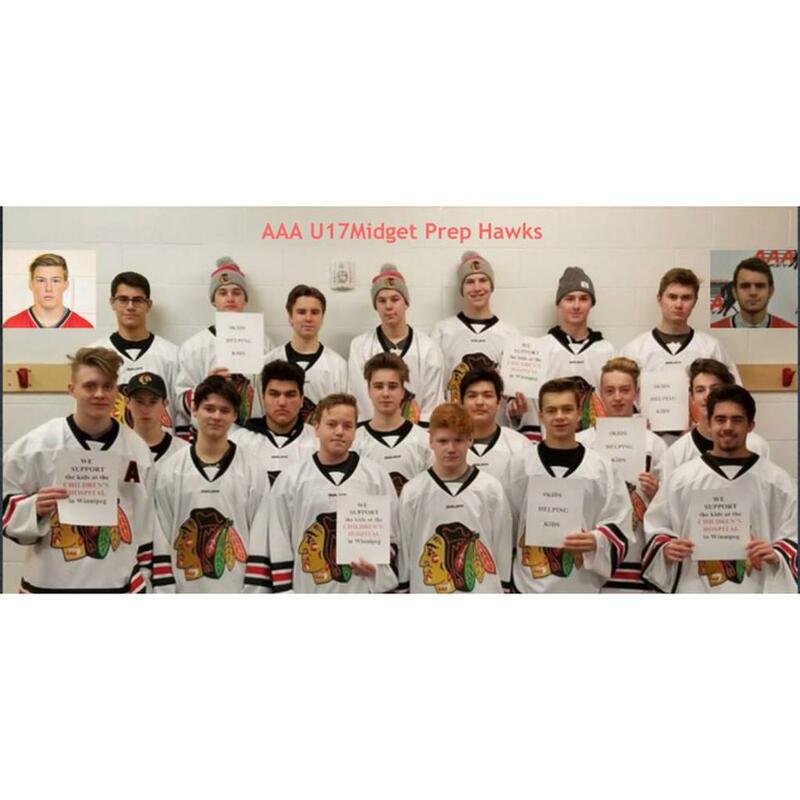 On November 27th, known as Giving Tuesday, the U17 Midget hawks made a big impact in the Winnipeg community donating a total of $525 to the Children’s Hospital. This donation had a special connection to the Hawks team with their own player Kasen Andrushko. Kasen was born with a very rare condition called Glycogen Storage Disease 1a which affects his blood sugar levels and can end up being life threatening if not managed correctly on a daily basis. The Children’s Hospital of Winnipeg has been involved with the Aundrushko family since Kasen was only 8 months old. When asked about the impact the hospital has had on Kasen’s life Dayna, mom of Kasen, says “They have helped so much, essentially saving his life and teaching us as a family how to manage his care.” With the care and guidance of the hospital Kasen has been able to live life to the fullest playing sports and exceed in school. In addition to being able to play sports and live a normal life Kasen was chosen to be the Winnipeg Children’s Hospital’s Champion Child for the years of 2012-2013. This title made him the spokesperson for the hospital speaking at special events and also traveling to Ottawa and Florida to represent all of the children at the hospital. For the past 15 years, the Andrushko family helps out the hospital by running their own toy drive and makes a donation to the hospital to help further the research the hospital does. 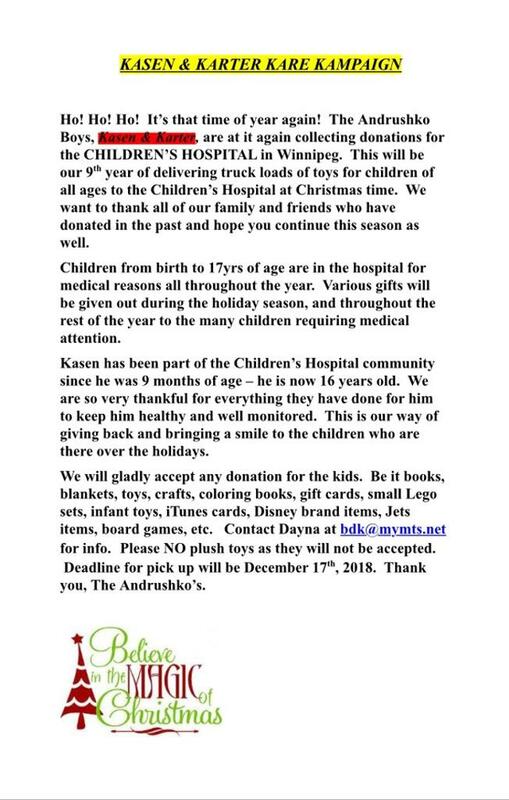 This year another mother on the Hawks team suggested to Kasen’s mom Dayna that they take the proceeds from one of the team’s 50/50 sales and donate it to the Winnipeg Children’s Hospital. With the rest of the team on board, they ended up selling $350 worth of tickets meaning they had a $175 donation to give the hospital. After Dayna contacted a friend at the Children’s Hospital, she was joyed to find out that there was a campaign going on where two anonymous donors would be matching the amount donated. This brought the Hawks donation total up to $525 which was brought to the hospital in person. Thank you to the Hawks and the Andrushko family for their amazing work in helping out the Winnipeg community. If you would like to help the Andrushko's with their toy drive, please see list of donations below and bring all donations to the Hockey Winnipeg offices located at 1100 Waverley Street Unit 3.